Jack, John and myself often used to make this in our flat in Sheffield. It’s easy to rustle up pretty quickly, and if you make your own authentic caesar dressing as we did, it’s proper and delicious too. The dressing is key to this dish; it’s a super-enriched mayonnaise, packed with powerful savoriness from garlic, parmesan, anchovies and olive oil. The richness is balanced by a vital squeeze of lemon juice. We always used chicken breast, gently baked in the oven until just cooked, but I’ve switched to using leg now as the darker flakey meat has more flavour and a more pleasing rustic feel that is nicely suited to this dish. 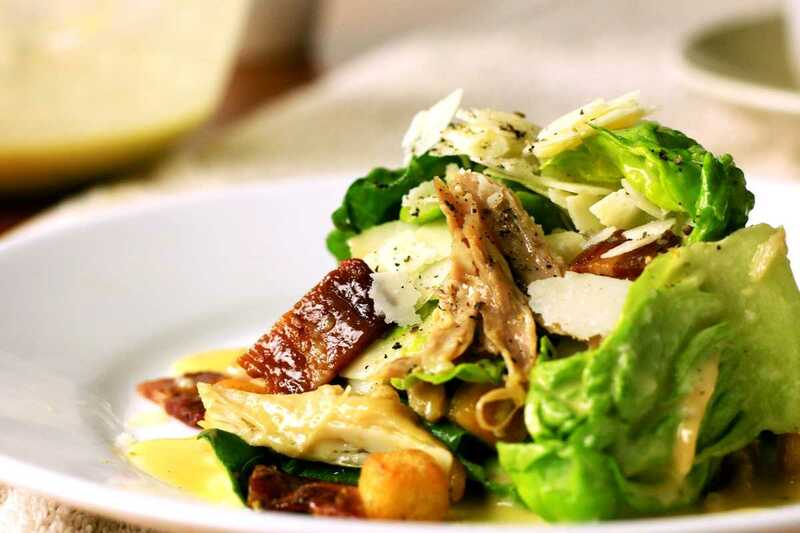 This salad provides a fantastic interplay of textures; balancing juicy shredded chicken with crunchy fresh leaves of lettuce and crisp bacon, all bound happily together by the glossy rich dressing. Extra crunch is given by lovely golden croutons. Heat the oven to 180C. Rub the chicken legs with olive oil, season generously with sea salt and place in a roasting tin, then roast in the oven until the skin is crisp and golden and the meat falling off the bone. Remove from the oven, leave to cool slightly then pick the meat off the bone, shredding it to medium sized pieces. Keep the roasting juices from the tray, skimming and discarding any fat from the surface. While the chicken is cooking, fry the bacon in olive oil until crisp, then cut into chunky lardons. Cut the bread into dice, then fry in olive oil, stirring constantly until light golden. Transfer to a tray lined with kitchen paper immediately to drain. Set aside. Now for the dressing; finely grate the parmesan and place in a bowl with the egg yolk, anchovy, garlic and chicken roasting juices. Whisk (or use a blender) until all incorporated and smooth, then begin to add the olive oil, very gradually, until it is emulsified and you have a thick mayonnaise. Add a squeeze of lemon juice to taste, and a couple of tablespoons of water until you have a sauce-like consistency. Season with salt, if needed. Pick and wash the lettuce leaves, and to finish the salad, simply toss everything together with the dressing and throw in a bowl.